I ordered one of NYX Jumbo Eye Pencils too but it was out of stock when they finally got to my order. 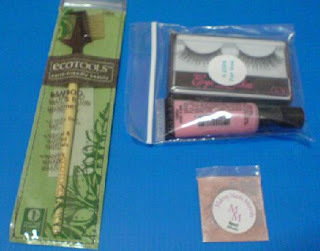 And believe it or not, here's what I got as freebies. The last 2 items were a free gift to me for they delayed my order and were really apologetic about it. I think it had something to do with the NYX Jumbo Eye Pencil. They were waiting for the supplier to restock so that they can send out my order but it didn't come in time and my package got delayed. But they were really nice and informed me about the OOS item and also told me they would be throwing in a free gift. I received my package soon after they shipped it and everything was really neatly packed. I was super excited when unwrapping everything in the package. I do apologise for the lack of photos because I was too engrossed playing with everything. The Jesse's Girl Color My World Baked Eyeshadows in Aqua and Earthtone are really pretty. The packaging made it look like a jewel. The pigmentation of these eyeshadows really do not disappoint. 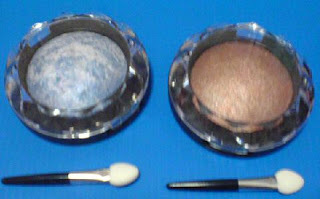 They are really pigmented as they are baked eyeshadows. Earthtone is a really flattering copper/bronze colour. I think it's very wearable. Aqua is this pretty blue shade with silver blended in it. When blended together, I find it a bit frosty but the shade of blue is really nice. 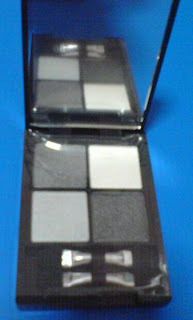 These shadows can also be used wet for more intense pigmentation. Overall, I find them not too bad but I probably wouldn't wear them for daytime. 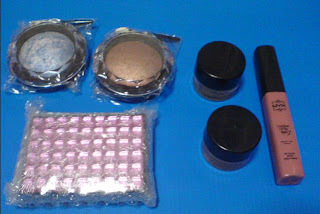 The downside is that there is no place to store the eyeshadow applicator that comes with it. The Jesse's Girl Bejeweled Eyeshadow Quad in 432A-1 is a grey eyeshadow quad and I love it. It looks a little plain on the site but it's not. It comes in this jewelled casing (on one side). The jewelled casing's cute but I don't dig it nor do I hate it. The grey shades in it are lovely. It's really a nice grey quad. The shades are a cream white, a light silver, a medium charcoal and a black. All the shades are a little shimmery but I don't think you can see the shimmers in the picture. I also got 2 NYX Concealer in A Jar (colour in photo is a bit off). These are the real reason why I ordered. I stumbled upon it on the site and went to look up reviews. Apparently they have rather good reviews. After going through colour swatches, I picked out Beige (a light medium shade that is yellow toned) and Yellow (a colour corrector). The NYX Concealer in A Jar is awesome. It's my Holy Grail now. It's about a 5g jar size but the glass surrounding it is super thick so the jar is bigger. 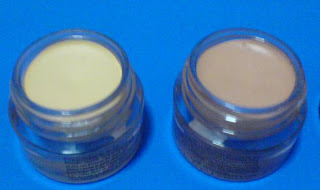 The concealer is creamy and very emollient. It's very easy to spread and blend and doesn't really cake. I love it in Beige, which is almost my skintone but darker. I picked Beige because I wanted a darker shade to cover up the dark eye circles. The one in Yellow helps to neutralise purplish dark eye circles, making the dark eye rings less obvious. But I find it leaving the area looking a little too white, like you have too much highlighters over it. Still trying to find a way to use the one in Yellow. NYX Megashine Lip Gloss in Natural is also really nice. It appears to be mauve-pink but on my lips, it's MLBB (my lips but better)! Super natural, super nice. I don't like over glossy lip glosses and this is just perfect. The only thing about this gloss I didn't like is the smell. It's supposed to be a cherry smell but I don't think it smells like it. Overall, I think it's a great gloss. I haven't really tried the freebies so that's about it. Very satisfied with this haul.